September 2012 marked two anniversaries - the end of the site's 10th summer, and 25 years since student loans were first obtained to cover the costs of a graduate school program. 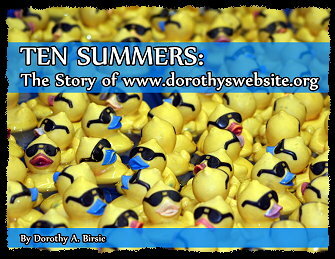 "Ten Summers: The Story of www.dorothyswebsite.org" is a book which incorporates the history of the website from its inception through the 2012 10th Anniversary summer, with additional materials from the summer of 2013. The story told in the book weaves together the two anniversaries and explains how they are related, including information relevant to the state of the student loan system in this country today. As with so many other things, matters never proceed quite as quickly as one might like, so there is still no news for those interested in obtaining a copy of the book in its final published format. This page has been added to provide both an excerpt from the book and access to samples of some of the past summer websites. Any news about the book will be posted on this page when available. Click here to view a pdf file of the book's table of contents. Why call the book "Ten Summers?" The site began as a computer exercise in the summer of 2003. Originally it was something that was supposed to last for only about a month. Over ten summers, the site evolved into the web entity visitors see today. One half of the story describes the history of www.dorothyswebsite.org plus how and why it came to have its present format. In addition to the history, the book includes 25+ poems which have appeared on the site, pictures and descriptions of each of the summer themes which began in 2006, a section of photographs from the "Attitude" collection and more, including a guide to the cards which have been handed out at the concerts over the years. But that is only half the story. Since the reason the site exists is tied directly to Dorothy's experiences within the student loan system, the other half of the book weaves that story in and out of the text. Anyone who has ever glanced through the Essay Archives section of the site has probably seen that the very first essay to be included concerned the student loan system. Creating a forum through which to express my concerns about the student loan system was probably the most important reason information was posted to the internet to begin with. Several years before creating the site I began seeing periodic anecdotes in the press about problems being encountered by those who had taken out student loans. The stories would appear, then go away; appear, then go away. Anecdotes are just that - singular, personal accounts, but the number and frequency of the appearances of the stories, taken together with my own experiences, made me wonder if they were symptomatic of greater problems brewing within the system. If there was one common factor which I noticed about the stories over the years, it was that a majority of the stories were about women. Since 2003, and especially within the last couple of years, those stories have involved ever-increasing outstanding debt, not only students but their relatives being pursued for repayment of the debt, and even people in their 60s still making payments on student loans. But again, those are just anecdotes. What is fact is that in 2010 total student loan debt in the U.S. exceeded outstanding revolving credit debt (the most of which is credit card debt) for the first time. At the time this summer 2014 site was posted, outstanding student loan debt in the U.S. had crossed the one trillion dollar mark, with no end in sight. The trend over the last few years especially has been for increased borrowing - and a higher number of loans slipping in to default. Before navigating away from the page if you think this has nothing to do with you, please think again and read the brief excerpt below. If the system continues on its current trajectory, there is no telling what it might mean for students, their families and even this country. The excerpt below is from the "Conclusion" section of the book. This story, the story of www.dorothyswebsite.org, has been two separate tales wrapped up in one. The first, a very specific one, is about the site itself. The second, a more general one, is about student loans and the student loan system in this country. Both have clear starting points and ending points which are undefined. While conclusions may be drawn about the site, it is possible for me only to raise questions about the student loan system. It was said in the introduction that the telling of this story may bring about the end of the site, and maybe it will. If it does, then the site will have been one small blip in the history of a medium which has come to play an important part of most people's lives. The site that began as a computer exercise grew over ten years in tandem with the more widespread use of the internet. Is it possible to point to anything which has been accomplished through the site, any value which has been created? In a small way, yes. For those who enjoy music, the site has grown to be a steady source of information for concert listings and to a lesser extent for other free products, services or events. Finding that information has given visitors access to everything from family-friendly activities to free birthday meals. Whether indirectly or directly, the site also has helped create jobs for musicians, support various aspects of the arts, provide information on a variety of science and technology topics in a manner which (hopefully) was easy to understand, and give others, particularly musicians and artists, the chance to let people know more about themselves and their work . . .
. . . The website may have grown to be something far bigger than originally intended, but has the student loan system as well? In the site's initial 2003 essay on student loans, the student loan program's origin in the Higher Education Act of 1965 was discussed. As outlined in the Act, the "Guaranteed Reduced Interest Loans to Students" program, of the Guaranteed Student Loan Program (as it has come to be known), began as a way to offer students the fullest possible educational opportunity, and perhaps more importantly, as A FINAL LINE OF FINANCIAL DEFENSE for students and their families. As a final line of financial defense, it would be reasonable to expect that a certain percentage of students would need to make use of the loans. That percentage has changed dramatically, however, especially from 2004 - 2012 (almost the same period in which the site has been in existence). During that period outstanding student debt tripled, from about $340 billion in 2004 to $966 billion at the end of the fourth quarter of 2012 [footnote for figures included in book text]. At the same time there has been a 70 percent increase in the number of borrowers and a 70 percent increase in the average balance per person. In other words, the trend has been for college students to increasingly borrow more to finance their education, and when they do borrow, to borrow greater amounts. One recent white paper on the debt says of student loans that they "have become a fact of life" - probably much more than what they were originally intended to be when the program was established in 1965 . . . Here are some of the most recent basic facts about student loans from a 2013 report by Donghoon Lee, a senior economist at the Federal Reserve Bank of New York . . .
- Total outstanding student loan debt almost tripled between 2004 and 2012, from about $340 billion in 2004 to $966 billion in the fourth quarter of 2012. - In that same period there has been a 70 percent increase in the number of borrowers and a 70 percent increase in the average balance per person. - However, about 44 percent of borrowers are not in repayment yet due to deferments or forbearances (due to the fact that they are still in school, etc.). When this group not yet in repayment is subtracted from the total, leaving only borrowers currently in repayment, the overall 90+ day delinquency rate rises to about 31 percent. Among borrowers under the age of 30 in repayment, the delinquency rate is about 35 percent. - The transition rate of borrowers in repayment from current to delinquent has been rising since 2008 from around six percent to nearly nine percent . . .
. . . Students whose loans are in default are not making payments on those loans. Due to a program which took effect in 2009, the number of students making no repayments on their loans maybe even higher, separated only by a matter of semantics and legal terminology and perhaps masking even greater problems within the system . . .
. . . Writers for the Liberty Street Economics blog, economists working at the intersection of research and Fed policymaking, also say that "student loans support the education of millions of students nationwide, yet much is unknown about the student loan market." This all perhaps begs the question, "How can a nation have close to one trillion dollars outstanding in what basically amounts to taxpayer money and yet know so little about that debt?" There is a huge difference between a single loan as an arm's length commercial market transaction and a trillion dollar's worth of federal government funded/guaranteed loans, which taken as a whole, have a potential for "systemic change" swaying the economic course of an entire generation or generations. And is it true, as one economist says, that "the calculus of power and the calculus of dollars are not so different at all?" One of the quotes used in the introduction to a 2007 website essay on technological change was " . . . No development is inevitable." The quote was taken from the 1940s book The Road to Serfdom by economist Friedrich A.von Hayek. Hayek was an economist of the belief that "each step away from the market system and toward social reforms of the welfare state is inevitably a journey that must end in a totalitarian state with neither efficiency nor liberty." But when it comes to the longer term effect of student loans, how are we as a nation to know what is possible, probable - or even inevitable - if we know so little about those loans? . . .
To this excerpt I would add one note. Although several new options for repayment for students have been added in the last few years, student debt is the only debt not dismissable through regular bankruptcy proceedings. Everyone always hopes things will go well in their lives, but what happens if they don't? With one exception, once a person takes out a student loan it stays with that person for life until it is paid off. The story in "Ten Summers" recounts some of the most exasperating situations I personally encountered within the student loan system and how that led to the founding of the site. In addition to the many portions of the book for those long-time site fans who have visited for so many years, my hope is that my personal "anecdote" will lead to many others coming forward with their own stories as well. Possible final formats for publication are still being reviewed, and information will be posted here when the entire book becomes available to all. Thank you for taking the time to visit this page. Have a story to share about student loans or know someone who does? Send an e-mail to the site. If you don't want to include your full name, that's fine, but please include some type of contact information. Send the e-mail to: studentloaninfo@dorothyswebsite.org. This website began in the summer of 2003 as a computer exercise which was supposed to last about a month. The "Ten Summers" story is the story of how the website started and why, with a sampling of poetry, photographs, artwork and other materials which have appeared on the site over the years. There have always been two phases to the site: the summer version which runs from June through September, and the fall/winter/spring version, which is posted the rest of the year. The "Summer Websites" section is being posted to augment materials in the book, and an effort is being made to recode pages so that all of the summer sites can be accessed via the internet. Beginning in 2006, each of the summer sites had a theme, and the themes also are explained at greater length in the book. The 2003 - 2005 and "themed" years are listed below. When a particular year's summer site is available to be viewed, the words "Click here . . ." will appear at the end of the line. It is my hope that viewers will enjoy seeing how the site has grown and changed over the years; please keep in mind that it was started by a person with no website design, computer coding/programming, graphics or art experience (which is pretty obvious in the early years of the site's existence). Everything that has been done with the site has been self taught, and the "hows" and "whys" are explained at greater length in the book. Since many of the poems which have appeared on the site are included in the book, generally only one poem from each summer will be reposted as an example of the artwork from the poetry pages for that year. Also, since agreements with Website Guests (poets, painters, photographers, sculptors, etc.) and Featured Artists (musicians) to display photographs, artworks and other materials were valid only for the period in which the works originally appeared on the site, those works will not be included in the summer website displays unless permission has been granted as per the note below. Also, former Guest Artists, Poets and others were given an opportunity to have their works appear as they did in the summer in which the works originally were included on the site. Some artists were no longer in the area or went on to other things, and there were potential copyright conflicts with certain materials remaining posted for an indefinite period of time, so . . . Notices were posted on the site's Facebook page when artists' works were included in the recoded sites below (scroll down into the 2014 timeline on Facebook). Summer 2003 (No theme) - Click here to view. Please note: Since this site was created with an early version of the Front Page software program, some features do not work or only work properly when viewed with older versions of Internet Explorer. Summer 2004 (No theme) Click here to view. Please note: Since this site was created partially with an early version of the Front Page software program, some features do not work or only work properly when viewed with older versions of Internet Explorer. Summer 2007 - "Pieces: Whole" - Click here to view. 5th Anniversary Summer! Summer 2011 - "Game Changer" - Click here to view. Also, in 2011 a second concept website called www.fringe-benefits.net was launched. Since that time the site has been posted at www.fringe-benefits.webs.com. However, due to complications with the site being hacked this past spring, pages from the current site are posted on the webs.com page. The "fringe-benefits.webs.com" pages have been updated and can be viewed by starting at www.dorothyswebsite.org/fringe-index.html. Summer 2012 - "Animal Magnetism"- Click here to view. 10th Anniversary Summer! The websites above were re-posted in conjunction with the website book. 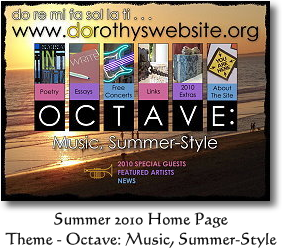 To view the full 2014 summer website as it appeared through September 30, 2014, please visit www.dorothyswebsite.org/2014index.html. The theme for Summer 2014 was "The Art of Progress." To view the Summer 2015 website, with the theme "Light Year," go to www.dorothyswebsite.org/2015index.html The summer site was on hiatus for 2016, and to view the Summer 2017 website, with the theme "Fine Feathered Friends," go to www.dorothyswebsite.org/2017index.html.